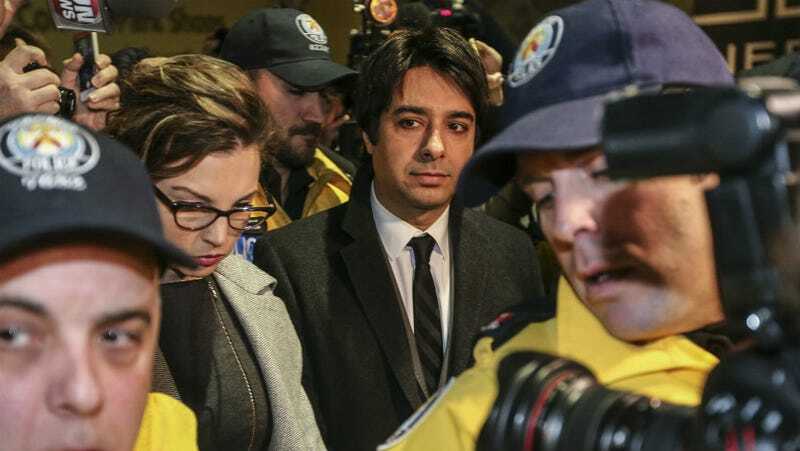 The sexual assault trial against disgraced Canadian radio host Jian Ghomeshi began on Monday. Two women have testified against him thus far; both have been aggressively cross-examined by Ghomeshi’s defense attorney about why they continued to communicate with him after the alleged assaults took place. Ghomeshi faces four counts of sexual assault and one count of overcoming resistance by choking, with three women expected to testify against him in all. The tactics the defense will be relying on have become clear pretty quickly: Defense lawyer Marie Henein questioned the first witness, who is remaining anonymous, about why she emailed Ghomeshi a photo of herself in a bikini a year after she says he hit her and pulled her hair. She asked the second witness, actress and former Air Force captain Lucy DeCoutere, why she sent Ghomeshi flowers after a weekend in which she says he choked and slapped her. Henein asked why DeCoutere would try to be friends with a man who allegedly assaulted her. “Yeah people do that. It’s a weird thing. But it’s real,” DeCoutere said. DeCoutere has testified that the 48-year-old CBC Radio host started choking and slapping her in the face without warning while they were kissing at his home in the summer of 2003. DeCoutere said that does not mean she liked being choked. “He choked me without consent because he never asked for it. He slapped me without consent because he never asked for it,” DeCoutere said. The first witness, meanwhile, who says Ghomeshi violently attacked her 13 years ago, testified that she used a bikini photo a year later as “bait” to try to get Ghomeshi to contact her, so she could demand an explanation for the assault. These aren’t uncommon reactions for people who have suffered violence at the hands of sexual or romantic partners (and attacking a sexual assault victim’s credibility is a defense tactic as common as it is ugly). Heinen’s approach, though, is fueling a debate in Canada about best practices for defense attorneys. And separately, it’s creating a debate about how the media covers these allegations; several news outlets filed a legal challenge asking for access to the first witness’s bikini photo, which has been sealed. Among those outlets is the Star, which first published the details of the allegations against Ghomeshi in the fall of 2014. To make the trial even more bizarre, a 19-year-old man was arrested Friday morning outside the courthouse after screaming at and threatening reporters with an electric saw. A reporter tackled the man after seeing the weapon and held him until police arrived.